But really, I am not kidding when I say this mirror is one of my favorite beauty purchases ever and you can find it with me wherever I travel. It’s been to New York, London, Paris, New Orleans…literally all over. The Glamcor Riki line first captured my heart at the IMATS trade show a few years ago. As soon as I saw the Riki Skinny mirror, it was love at first sight. It’s thin, sleek design is what initially drew me in but once I saw the multiple light settings and Bluetooth capabilities, that was it, it HAD to be mine. It has come on EVERY single trip with me and because it’s so thin, it fits perfectly between the clothes in my suitcase and gives me the light I need for a flawless makeup application even in the worst lit hotel room. It also includes a phone clip so that you can mount your cell phone onto the mirror. Perfect for doing makeup tutorials on Instagram stories or just taking the perfect selfie without having your arm in the shot. You can even connect your phone to the mirror so that a simple press of a mirror button will take the shot for you! You can imagine my excitement when I learned about the Riki Tall. The larger vanity version of my coveted Riki Skinny. In addition to eb 16 inches taller and 11 inches wider, the Riki Tall comes with super-powerful daylight LEDs which makes her the lightest, brightest, full-sized lighted vanity mirror on the market. YAAAASSSSSSS QUEEN! Also, like the little sister Riki Skinny, it comes with the five stage dimming function to perfect your look for every lighting situation – with just the touch of a finger. Add to that a remote controlled Bluetooth selfie function for that perfectly lit wide shot and a rear mounted USB charging port, and you’re ready for anything. 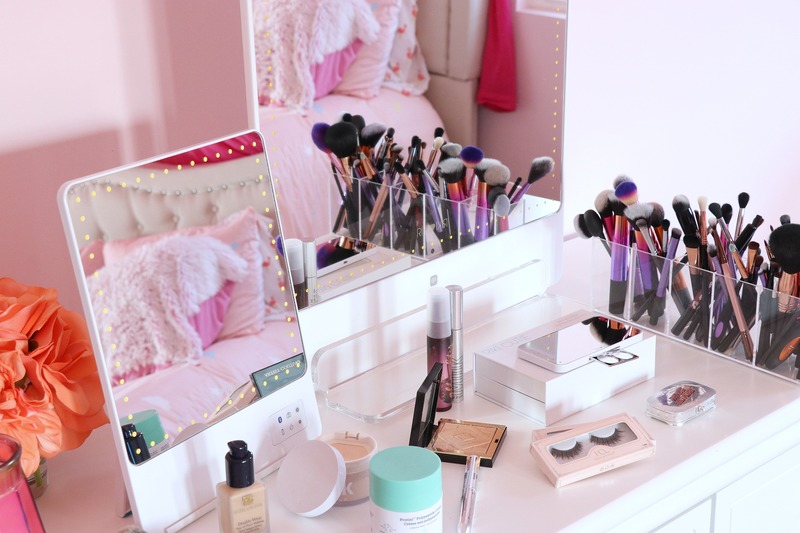 This is the big mirror that you can always find on my makeup desk, its the perfect size and shape and seriously has the ABSOLUTE best lighting quality and color. Last but not least is the newest addition to the Riki line, the Riki Cutie. Have you ever been in a badly lit bathroom, club or the back of an Uber trying to balance a mirror, your makeup and your cell phone light? Don’t lie, we have ALL been there. Enter the Riki Cutie. It’s 100% portable, powerful and has 3 brightness levels along with a built in stand and retractable finger ring. It’s also shatterproof and perfect for keeping in your purse. I have owned and tested many mirrors over the years and while each one had it pro’s, there was always a feature or element that was missing. With my Riki’s they have literally EVERYTHING I want and more. So whether it’s for your own personal use, or a gift for a friend or loved one, I promise you won’t be disappointed. You can shop the entire line HERE! Don’t forget to use code “CurvesToContour” to save 15%!